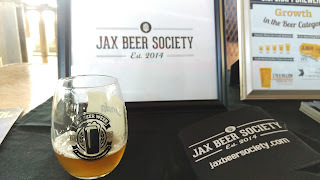 BrewNymph®: It's Jax Beer Week! It was a beer tasting event, featuring the eight Jax breweries (Founding Members of the Jax Beer Society: Aardwolf Brewing, Bold City Brewery, Engine 15 Brewing Co., Green Room Brewing, Intuition Ale Works, Pinglehead Brewing, Veterans United Craft Brewery, Zeta Brewing) and more. With food, music, and a Blind IPA tasting of 8 Jax brewery IPAs, it was a great way to get the Week going!